Let’s give this topic one more quick look. Product identification, serialization and tracking are key elements for any production environment. Parts are labeled with all kinds of marks: alpha-numeric serial numbers, date stamps, barcodes, etc.. There are a lot of marking methods available out there including dot-peen, chemical etching, pad printing, ink-jet printing, and laser marking. 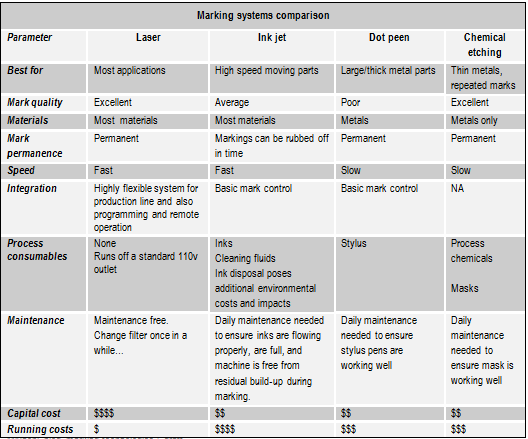 As manufacturers of laser markers and laser marking systems, we, of course, believe that there are many good reasons why laser marking makes sense in your manufacturing operation?